• The Board heard proposals from two firms to provide technology services to the Board. o All proposals are available for public inspection at the office of the LULST Board Secretary, located at 203 East Plaquemine St., Jennings, LA 70546 between 8:00am-4:00pm on weekdays. o The Board will review proposals and send any further questions for the firms’ responses, with the intent to make a decision at the next Special Board Meeting on May 10, 2018. 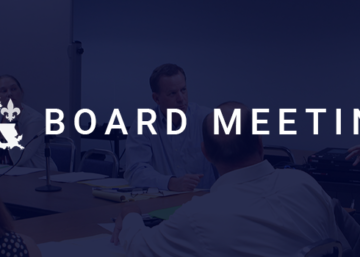 • A special meeting will be held to select the Executive Director and Technology Firm for the LULST Board on Wednesday, May 9, 2018 at Tunk’s Cypress Inn, 9507 Hwy 28, Boyce, LA 71409 at 1:00pm. • Amber Hymel motioned to go into Executive Session at 10:06 AM to interview applicants for the position of Executive Director. Motion was seconded by Tiffani Delapasse and passed by the board. • Executive Session was ended at 11:56 AM by a motion from Tiffani Delapasse, a second from Greg Ruppert and a unanimous vote by the board. Motion to Adjourn was made by Amber Hymel, seconded by Amanda Granier and unanimously passed. The meeting ended at 11:57am.